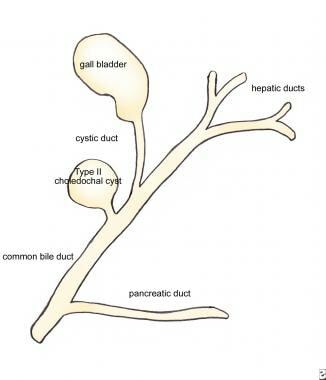 Choledochal cysts are congenital bile duct anomalies (see the image below). These cystic dilatations of the biliary tree can involve the extrahepatic biliary radicles, the intrahepatic biliary radicles, or both. Computed tomography (CT) scan of a choledochal cyst involving the common hepatic duct. The classic triad in adults with choledochal cysts is abdominal pain, jaundice, and palpable right upper quadrant abdominal mass. However, this triad is found in only 10-20% of patients. Percutaneous transhepatic cholangiography (PTC) and endoscopic retrograde cholangiopancreatography (ERCP) are used to supplement the above noninvasive imaging studies when those studies fail to sufficiently delineate the relevant anatomy. No medical therapy specifically targets the etiology of choledochal cysts, nor is any drug or any type of nonsurgical modality curative. Patients with choledochal cysts who present at a late stage (ie, after the development of advanced cirrhosis and portal hypertension) may not be good candidates for surgery because of the prohibitive morbidity and mortality associated with these comorbid conditions. Patients who present with cholangitis should be treated with broad-spectrum antibiotic therapy directed against common biliary pathogens, such as Escherichia coli and Klebsiella species, in addition to other supportive measures, such as volume resuscitation. Operative specimen of a type I choledochal cyst. In 1959, Alonzo-Lej produced a systematic analysis of choledochal cysts, reporting on 96 cases. He devised a classification system, dividing choledochal cysts into 3 categories, and outlined therapeutic strategies. Todani has since refined this classification system to include 5 categories. This article reviews the incidence, pathophysiology, diagnosis, and management of choledochal cysts. A history of biliary surgery, pancreatitis, cholangitis, early postoperative complications, and late postoperative complications occurred, respectively, 5.1, 5.4, 6.4, 2.0, and 3.3 times more frequently in adults than they did in children. The classic triad of abdominal pain, jaundice, and a palpable right upper quadrant abdominal mass occurred 6.7 times more frequently in children than in adults. Fibrosis of the cyst wall was peculiar to children. Signs of inflammation and hyperplasia were primarily seen in adults. Long-term complications occurred in 29.7% of adults but in only 9.3% of children. For patient education resources, see the Digestive Disorders Center, as well as Gallstones, Pancreatitis, Cirrhosis, and Abdominal Pain in Adults. No strong unifying etiologic theory exists for choledochal cysts. The pathogenesis is probably multifactorial. In many patients with choledochal cysts, an anomalous junction between the common bile duct and the pancreatic duct can be demonstrated. 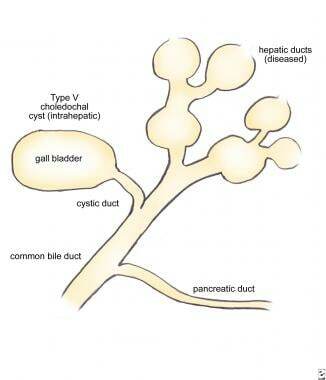 This occurs when the pancreatic duct empties into the common bile duct more than 1 cm proximal to the ampulla. Some series, such as the one published by Miyano and Yamataka in 1997, have documented such anomalous junctions in 90-100% of patients with choledochal cysts. 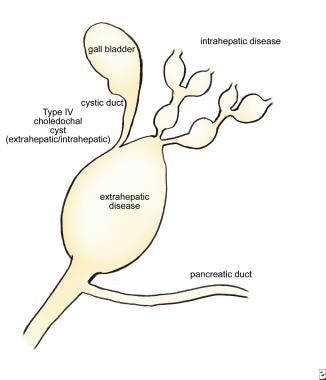 This abnormal union allows pancreatic secretions to reflux into the common bile duct, where the pancreatic proenzymes become activated, damaging and weakening the bile duct wall. Defects in epithelialization and recanalization of the developing bile ducts and congenital weakness of the ductal wall also have been implicated. The result is the formation of a choledochal cyst. These anomalies are classified according to the system published by Todani and coworkers. Five major classes of choledochal cysts exist (ie, types I-V), with subclassifications for types I and IV (ie, types IA, IB, IC; types IVA, IVB). Type I cysts (see image below) are the most common and represent 80-90% of choledochal cysts. They consist of saccular or fusiform dilatations of the common bile duct, which involve either a segment of the duct or the entire duct. They do not involve the intrahepatic bile ducts. Type IA is saccular in configuration and involves either the entire extrahepatic bile duct or the majority of it. Type IB is saccular and involves a limited segment of the bile duct. Type IC is more fusiform in configuration and involves most or all of the extrahepatic bile duct. Type II choledochal cysts (see image below) appear as an isolated true diverticulum protruding from the wall of the common bile duct. The cyst may be joined to the common bile duct by a narrow stalk. 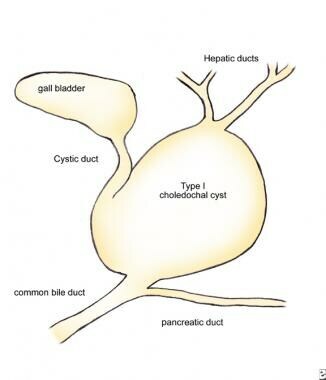 Type III choledochal cysts (see image below) arise from the intraduodenal portion of the common bile duct and are described alternately by the term choledochocele. Type III choledochal cyst (choledochocele). Type IVA cysts (see image below) consist of multiple dilatations of the intrahepatic and extrahepatic bile ducts. Type IVB choledochal cysts are multiple dilatations involving only the extrahepatic bile ducts. Type IV choledochal cyst (extrahepatic and intrahepatic disease). Type V choledochal cyst (intrahepatic, Caroli disease). Choledochal cysts are relatively rare in Western countries. Reported frequency rates range from 1 case per 100,000-150,000 to 1 case per 2 million live births. Choledochal cysts are more prevalent in females than males, with a female-to-male ratio in the range of 3:1 to 4:1. The morbidities associated with choledochal cysts depend on the age of the patient at the time of presentation. Infants and children may develop pancreatitis, cholangitis, and histologic evidence of hepatocellular damage. Adults in whom subclinical ductal inflammation and biliary stasis may have been present for years may present with one or more severe complications, such as hepatic abscesses, cirrhosis, portal hypertension, recurrent pancreatitis, cholangitis, and cholelithiasis. 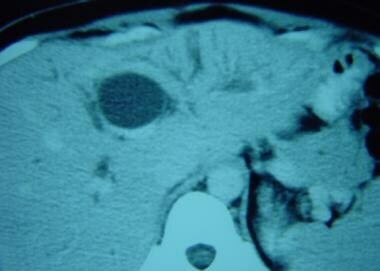 Cholangiocarcinoma is the most feared complication of choledochal cysts, with a reported incidence of 9-28%. Wu and colleagues exposed cells from a cholangiocarcinoma cell line to bile from patients with choledochal cysts and from controls with structurally normal biliary systems. The bile from the patients with choledochal cysts produced significantly more mitogenic activity in the cancer cell line than the bile from the controls. Patients undergoing excision of a choledochal cyst are subject to the usual complications associated with surgery, including hemorrhage, wound infection, bowel obstruction, and thrombotic complications. Postoperatively, patients are at risk of developing pancreatitis and ascending cholangitis. Late postoperative complications include development of intrahepatic bile duct stones and cholangiocarcinoma. Adult patients with long-standing subclinical ductal inflammation and biliary stasis may develop one or more of the following complications: hepatic abscesses, cirrhosis, portal hypertension, recurrent pancreatitis, and cholelithiasis. Other potential complications include cyst rupture, secondary biliary cirrhosis, bleeding, and obstructive jaundice. Chen CP, Cheng SJ, Chang TY, Yeh LF, Lin YH, Wang W. Prenatal diagnosis of choledochal cyst using ultrasound and magnetic resonance imaging. Ultrasound Obstet Gynecol. 2004 Jan. 23(1):93-4. [Medline]. Yu ZL, Zhang LJ, Fu JZ, Li J, Zhang QY, Chen FL. Anomalous pancreaticobiliary junction: image analysis and treatment principles. Hepatobiliary Pancreat Dis Int. 2004 Feb. 3(1):136-9. [Medline]. Fitoz S, Erden A, Boruban S. Magnetic resonance cholangiopancreatography of biliary system abnormalities in children. Clin Imaging. 2007 Mar-Apr. 31(2):93-101. [Medline]. Ulas M, Polat E, Karaman K, et al. Management of choledochal cysts in adults: a retrospective analysis of 23 patients. Hepatogastroenterology. 2012 Jun. 59(116):1155-9. [Medline]. Lee SE, Jang JY, Lee YJ, et al. Choledochal cyst and associated malignant tumors in adults: a multicenter survey in South Korea. Arch Surg. 2011 Oct. 146(10):1178-84. [Medline]. Ahn SM, Jun JY, Lee WJ, et al. Laparoscopic total intracorporeal correction of choledochal cyst in pediatric population. J Laparoendosc Adv Surg Tech A. 2009 Oct. 19(5):683-6. [Medline]. Douglas AH. Case of dilatation of the common bile duct. Monthly J M Sci (London). 1852. 14:97. Shah OJ, Shera AH, Zargar SA, et al. Choledochal cysts in children and adults with contrasting profiles: 11-year experience at a tertiary care center in Kashmir. World J Surg. 2009 Nov. 33(11):2403-11. [Medline]. Singham J, Yoshida EM, Scudamore CH. Choledochal cysts: part 1 of 3: classification and pathogenesis. Can J Surg. 2009 Oct. 52(5):434-40. [Medline]. [Full Text]. Miyano T, Yamataka A. Choledochal cysts. Curr Opin Pediatr. 1997 Jun. 9(3):283-8. [Medline]. Kilambi R, Singh AN, Madhusudhan KS, Das P, Pal S. Choledochal cyst of the proximal cystic duct: a taxonomical and therapeutic conundrum. Ann R Coll Surg Engl. 2017 Nov 28. e1-e4. [Medline]. Madadi-Sanjani O, Wirth TC, Kuebler JF, Petersen C, Ure BM. Choledochal cyst and malignancy: a plea for lifelong follow-up. Eur J Pediatr Surg. 2017 Dec 19. [Medline]. Wu GS, Zou SQ, Luo XW, Wu JH, Liu ZR. Proliferative activity of bile from congenital choledochal cyst patients. World J Gastroenterol. 2003 Jan. 9(1):184-7. [Medline]. Jensen KK, Sohaey R. Antenatal sonographic diagnosis of choledochal cyst: Case report and imaging review. J Clin Ultrasound. 2015 Nov. 43 (9):581-3. [Medline]. Oduyebo I, Law JK, Zaheer A, Weiss MJ, Wolfgang C, Lennon AM. 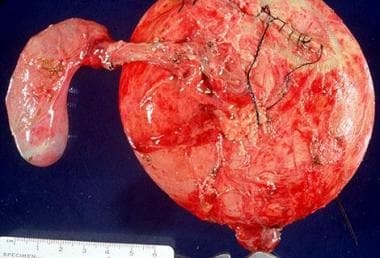 Choledochal or pancreatic cyst? Role of endoscopic ultrasound as an adjunct for diagnosis: a case series. Surg Endosc. 2015 Sep. 29 (9):2832-6. [Medline]. Nagi B, Kochhar R, Bhasin D, Singh K. Endoscopic retrograde cholangiopancreatography in the evaluation of anomalous junction of the pancreaticobiliary duct and related disorders. Abdom Imaging. 2003 Nov-Dec. 28(6):847-52. [Medline]. Senthilnathan P, Patel ND, Nair AS, Nalankilli VP, Vijay A, Palanivelu C. Laparoscopic management of choledochal cyst-technical modifications and outcome analysis. World J Surg. 2015 Oct. 39 (10):2550-6. [Medline]. Aly MYF, Mori Y, Miyasaka Y, et al. Laparoscopic surgery for congenital biliary dilatation: a single-institution experience. Surg Today. 2018 Jan. 48 (1):44-50. [Medline]. Nag HH, Sisodia K, Sheetal P, Govind H, Chandra S. Laparoscopic excision of the choledochal cyst in adult patients: An experience. J Minim Access Surg. 2017 Oct-Dec. 13 (4):261-4. [Medline]. [Full Text]. Martinez-Ordaz JL, Morales-Camacho MY, Centellas-Hinojosa S, Roman-Ramirez E, Romero-Hernandez T, de la Fuente-Lira M. [Choledochal cyst during pregnancy. Report of 3 cases and a literature review] [Spanish, English]. Cir Cir. 2016 Mar-Apr. 84(2):144-53. [Medline]. [Full Text]. Diao M, Li L, Cheng W. Recurrence of biliary tract obstructions after primary laparoscopic hepaticojejunostomy in children with choledochal cysts. Surg Endosc. 2015 Dec 10. [Medline]. Chang J, Walsh RM, El-Hayek K. Hybrid laparoscopic-robotic management of type IVa choledochal cyst in the setting of prior Roux-en-Y gastric bypass: video case report and review of the literature. Surg Endosc. 2015 Jun. 29(6):1648-54. [Medline]. Jordan PH Jr, Goss JA Jr, Rosenberg WR, Woods KL. Some considerations for management of choledochal cysts. Am J Surg. 2004 Jun. 187(6):790-5. [Medline]. Edil BH, Olino K, Cameron JL. The current management of choledochal cysts. Adv Surg. 2009. 43:221-32. [Medline]. Visser BC, Suh I, Way LW, Kang SM. Congenital choledochal cysts in adults. Arch Surg. 2004 Aug. 139(8):855-60; discussion 860-2. [Medline]. Shimotakahara A, Yamataka A, Yanai T, et al. Roux-en-Y hepaticojejunostomy or hepaticoduodenostomy for biliary reconstruction during the surgical treatment of choledochal cyst: which is better?. Pediatr Surg Int. 2005 Jan. 21(1):5-7. [Medline]. Mukhopadhyay B, Shukla RM, Mukhopadhyay M, et al. 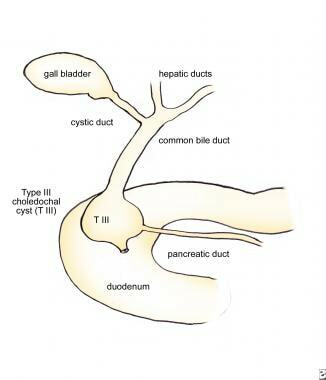 Choledochal cyst: A review of 79 cases and the role of hepaticodochoduodenostomy. J Indian Assoc Pediatr Surg. 2011 Apr. 16(2):54-7. [Medline]. [Full Text]. Lee H, Hirose S, Bratton B, Farmer D. Initial experience with complex laparoscopic biliary surgery in children: biliary atresia and choledochal cyst. J Pediatr Surg. 2004 Jun. 39(6):804-7; discussion 804-7. [Medline]. Jang JY, Kim SW, Han HS, Yoon YS, Han SS, Park YH. Totally laparoscopic management of choledochal cysts using a four-hole method. Surg Endosc. 2006 Nov. 20(11):1762-5. [Medline]. Woo R, Le D, Albanese CT, Kim SS. Robot-assisted laparoscopic resection of a type I choledochal cyst in a child. J Laparoendosc Adv Surg Tech A. 2006 Apr. 16(2):179-83. [Medline]. Lee SC, Kim HY, Jung SE, Park KW, Kim WK. Is excision of a choledochal cyst in the neonatal period necessary?. J Pediatr Surg. 2006 Dec. 41(12):1984-6. [Medline]. Woon CY, Tan YM, Oei CL, Chung AY, Chow PK, Ooi LL. Adult choledochal cysts: an audit of surgical management. ANZ J Surg. 2006 Nov. 76(11):981-6. [Medline]. Rose JB, Bilderback P, Raphaeli T, et al. Use the duodenum, it’s right there: a retrospective cohort study comparing biliary reconstruction using either the jejunum or the duodenum. JAMA Surg. 2013 Sep. 148 (9):860-5. [Medline]. [Full Text]. Chijiiwa K, Koga A. Surgical management and long-term follow-up of patients with choledochal cysts. Am J Surg. 1993 Feb. 165(2):238-42. [Medline]. Dundas SE, Robinson-Bridgewater LA, Duncan ND. Antenatal diagnosis of a choledochal cyst. Case management and literature review. West Indian Med J. 2002 Sep. 51(3):184-7. [Medline]. Fieber SS, Nance FC. Choledochal cyst and neoplasm: a comprehensive review of 106 cases and presentation of two original cases. Am Surg. 1997 Nov. 63(11):982-7. [Medline]. Gallivan EK, Crombleholme TM, D'Alton ME. Early prenatal diagnosis of choledochal cyst. Prenat Diagn. 1996 Oct. 16(10):934-7. [Medline]. Hernandez Bartolome MA, Fuerte Ruiz S, Manzanedo Romero I, et al. Biliary cystadenoma. World J Gastroenterol. 2009 Jul 28. 15(28):3573-5. [Medline]. [Full Text]. Hewitt PM, Krige JE, Bornman PC, Terblanche J. Choledochal cysts in adults. Br J Surg. 1995 Mar. 82(3):382-5. [Medline]. Ishibashi T, Kasahara K, Yasuda Y, Nagai H, Makino S, Kanazawa K. Malignant change in the biliary tract after excision of choledochal cyst. Br J Surg. 1997 Dec. 84(12):1687-91. [Medline]. Kubota H, Eckelman WC, Poulose KP, Reba RC. Technetium-99m-pyridoxylideneglutamate, a new agent for gallbladder imaging: comparison with 131I-rose bengal. J Nucl Med. 1976 Jan. 17(1):36-9. [Medline]. Lindberg CG, Hammarstrom LE, Holmin T, Lundstedt C. Cholangiographic appearance of bile-duct cysts. Abdom Imaging. 1998 Nov-Dec. 23(6):611-5. [Medline]. Rabie ME, Al-Humayed SM, Hosni MH, Katwah RA, Dewan M. Choledochocele: the disputed origin. Int Surg. 2002 Oct-Dec. 87(4):221-5. [Medline]. Rha SY, Stovroff MC, Glick PL, Allen JE, Ricketts RR. Choledochal cysts: a ten year experience. Am Surg. 1996 Jan. 62(1):30-4. [Medline]. Rose JB, Bilderback P, Raphaeli T, et al. Use the duodenum, it’s right there: a retrospective cohort study comparing biliary reconstruction using either the jejunum or the duodenum. JAMA Surg. 2013 Sep. 148(9):860-5. [Medline]. Saing H, Han H, Chan KL, et al. Early and late results of excision of choledochal cysts. J Pediatr Surg. 1997 Nov. 32(11):1563-6. [Medline]. Schultz RM. The potential role of cytokines in cancer therapy. Prog Drug Res. 1992. 39:219-50. [Medline]. Stringer MD, Dhawan A, Davenport M, Mieli-Vergani G, Mowat AP, Howard ER. Choledochal cysts: lessons from a 20 year experience. Arch Dis Child. 1995 Dec. 73(6):528-31. [Medline]. Weyant MJ, Maluccio MA, Bertagnolli MM, Daly JM. Choledochal cysts in adults: a report of two cases and review of the literature. Am J Gastroenterol. 1998 Dec. 93(12):2580-3. [Medline]. Yamataka A, Ohshiro K, Okada Y, et al. Complications after cyst excision with hepaticoenterostomy for choledochal cysts and their surgical management in children versus adults. J Pediatr Surg. 1997 Jul. 32(7):1097-102. [Medline]. Gadelhak N, Shehta A, Hamed H. Diagnosis and management of choledochal cyst: 20 years of single center experience. World J Gastroenterol. 2014 Jun 14. 20 (22):7061-6. [Medline]. Qiao G, Li L, Li S, et al. Laparoscopic cyst excision and Roux-Y hepaticojejunostomy for children with choledochal cysts in China: a multicenter study. Surg Endosc. 2015 Jan. 29(1):140-4. [Medline]. Tang J, Zhang D, Liu W, Zeng JX, Yu JK, Gao Y. Differentiation between cystic biliary atresia and choledochal cyst: A retrospective analysis. J Paediatr Child Health. 2017 Nov 3. [Medline]. Nuclear medicine scan of a choledochal cyst. Computed tomography (CT) scan of a choledochal cyst demonstrating intrahepatic extension involving the main left hepatic duct. Computed tomography (CT) scan demonstrating a large choledochal cyst and the adjacent gall bladder. Computed tomography (CT) scan of a large, saccular type I choledochal cyst. Diagnostic ultrasonogram demonstrating a type I choledochal cyst in a 4-month-old child presenting with hyperbilirubinemia and transaminase elevations. Intraoperative cholangiogram of a type I choledochal cyst. Intraoperative image of a Roux-en-Y hepaticojejunostomy to restore biliary-enteric continuity following resection of a choledochal cyst.